Reporting Services does not provide out of-the-box support for use of information from your queries in Page Headers and Footers. There are two ways around this. The first way is to create controls in the body of your report, holding the values you need to display in the header and/or footer. You can set these controls to “hidden”, and place them in some out-of-the-way place, towards the bottom of the report. Then, you can set expressions on controls in your header and footer sections to the value of the control in the body of your report. 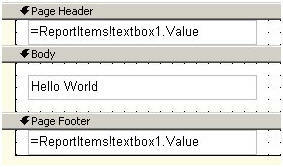 In the following example, shown in Figure 27, I placed a textbox control in the body of the report named “textbox1”, with a value of “Hello World”. In the header section, I placed a textbox with a value of “=ReportItems!textbox1.Value”. I then copied the control in the header section and pasted it into the footer section. If you preview this report, the value of “textbox1” will be displayed in the header and footer. A slightly cleaner option, in my opinion, is to create a public function that can be called to set the value of a variable, which can then be used in any or all sections of the report body, header, and footer. Figure shows the embedded code that creates this SetReportTitle function, containing the _Title variable. 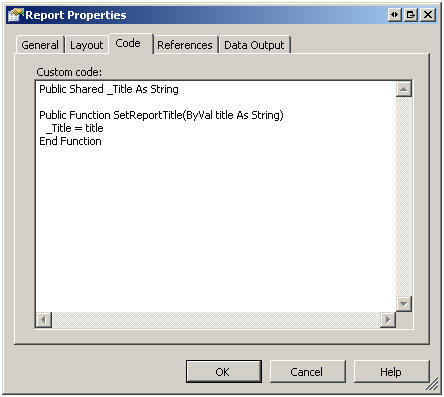 In this example, you can then simply set the value of the hidden textbox in the body of your report to “=Code.SetReportTitle(“Report Title”)“. This calls our function and sets the value of the _Title variable to Report Title. Now, you can set the value of any control in the header or footer to “=Code._Title”. The variable can be used in any or all sections of the report body, header, and footer.